In order to bring in a psychedelic twist to the scenes, all the objects were painted completely white while abstract, colourful projections danced on their surfaces. Haze Daze was a hilarious play poking fun at the Indonesian forest fires incident. The play narrated the entire event except instead of a forest; the haze was the result of a marijuana field caught in flames. Naturally, hilarity ensued. 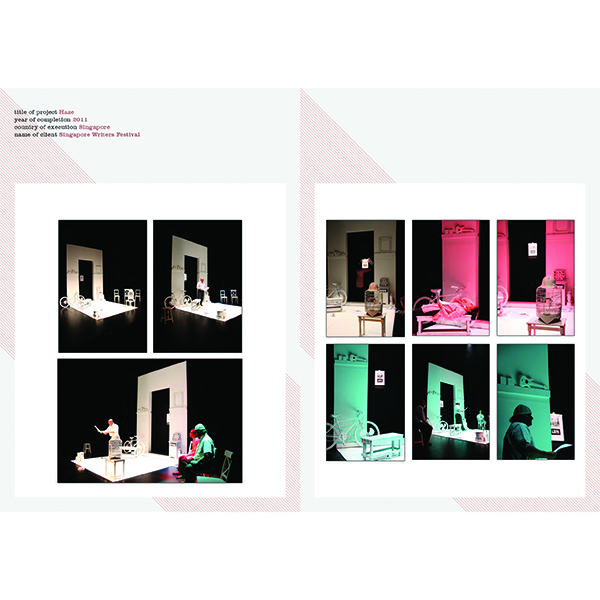 The primary challenge for this set design project was to create a design that added to the humour while keeping in mind the content of the play. In order to bring in a psychedelic twist to the scenes, all the objects were painted completely white while abstract, colourful projections danced on their surfaces.